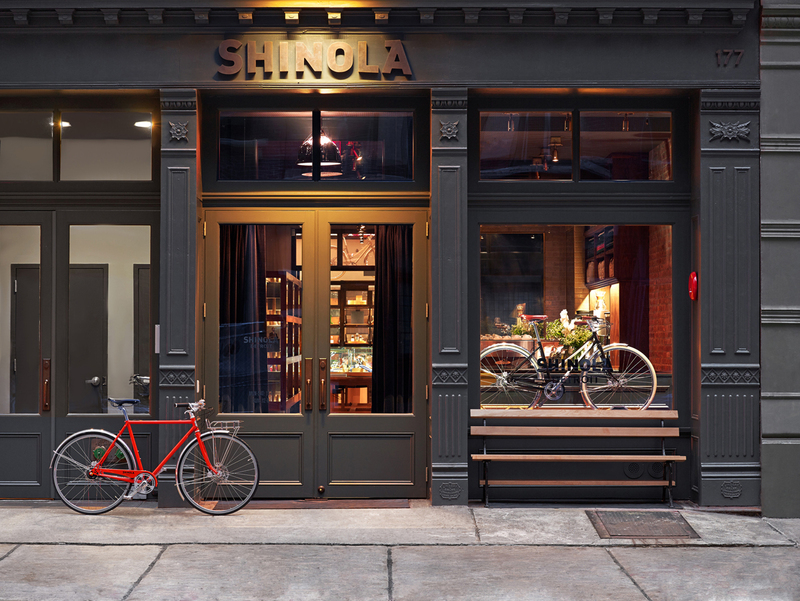 Shinola's new store in Tribeca is located at 177 Franklin Street. The Rockwell Group-designed space includes a cafe run by The Smile in front. The soaring space has been carved out of a former cold-storage facility for cheese (a nod to this neighborhood's own industrial past). Rockwell-designed white oak tables fill the center of the space, contrasting existing poured-concrete floors and a newly-built vaulted plaster ceiling with a faux skylight that uses daylighting technology. The giant 1930s-era bronze map of the world on the wall was found at Wyeth and came from the old Rockefeller Center offices of an oil company. To fabricate the brass-and-steel catwalk wrapping the first floor, accessible by a brass spiral staircase, the firm hired Total Metal Resources, a blacksmith in Greenpoint, Brooklyn. Other regional workshops with pieces in the showroom include Brooklyn-based Uhuru (chairs on the first floor), Walters Custom Cabinetry in Pennsylvania (the aforementioned white oak tables) and Chapman Manufacturing Company in Massachusetts (custom reproductions of brass library lamps). Also sourced from Wyeth are the case goods at the back of the store displaying Shinola's colorful leather goods. Read on for more details of Shinola's effort to reboot Detroit manufacturing, from Dwell's July/August 2013 issue. In Dwell's July/August "Made in America" issue, we profiled Shinola, a new heritage brand bringing cottage industry back to Detroit. The company—which makes bicycles, leather goods, and watches in the Argonaut building, which it shares with College for Creative Studies—aims to increase factory production and help resurrect Motor City's manufacturing legacy. Now, New Yorkers can see the goods in person, as Shinola has opened a flagship store at 177 Franklin Street in Tribeca. Designed by Rockwell Group, the soaring space has been carved out of a former cold-storage facility for cheese (a nod to this neighborhood's own industrial past). Rockwell-designed white oak tables fill the center of the space, contrasting existing poured-concrete floors and a newly-built vaulted plaster ceiling with a faux skylight that uses daylighting technology. The giant 1930s-era bronze map of the world on the wall was found at Wyeth and came from the old Rockefeller Center offices of an oil company. Also sourced from Wyeth are the case goods at the back of the store displaying Shinola's colorful leather goods. To fabricate the brass-and-steel catwalk wrapping the first floor, accessible by a brass spiral staircase, the firm hired Total Metal Resources, a blacksmith in Greenpoint, Brooklyn. Other regional workshops with pieces in the showroom include Brooklyn-based Uhuru (chairs on the first floor), Walters Custom Cabinetry in Pennsylvania (the aforementioned white oak tables) and Chapman Manufacturing Company in Massachusetts (custom reproductions of brass library lamps).